Sometimes a TV commercial can be like a time capsule of a whole era. This commercial is all about the 80's - a lot! In the ad a young Alfonso Ribeiro (sitcom second banana in "Silver Spoons" & "The Fresh Prince of Bel-Air") shows off his dancing skills, and how you too can someday be as cool as Carlton. Afternoon cartoon time used to be littered with these sorts of ads, and usually they were rip-offs that only succeeded in getting your mom to yell at you. This ad is for more than just a Ginsu knife, or an inside-the-egg-scrambler - your $19.99 earns you the rare privilege to buy into a whole new lifestyle. Not only do you get a breakdancing book, but also a poster, two rap LP's, and best of all - a giant sheet of cardboard to perfect your moves. Panasonic has gone seriously old school with a range of affordable stereo monitor headphones aimed at part-time DJs and home enthusiasts. The RP-HTX7PP lineup features 40mm drivers with 7-22 kHZ frequency response, a 1/4-inch stereo plug and lightweight construction that makes them easy to toss in your gear bag to take anywhere. They come with a 4 ft cord and 6.6 ft extension if you need a little more distance between you and your audio gear, which is a nice touch. The best news is that they carry a street price of under $50 and the general consensus is that they offer excellent sound and comfort for the price. Available in black (the cheapest) and retro shades or cream, blue, refrigerator white and green (the coolest). 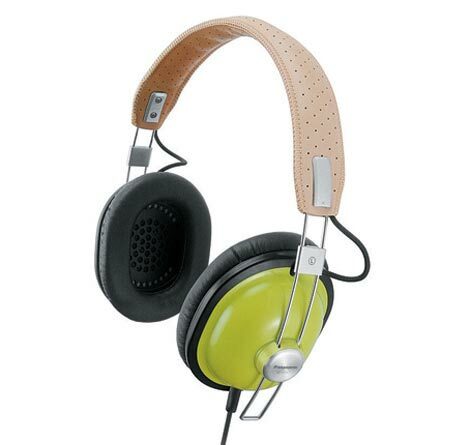 These should be an excellent replacement for my ancient and much abused AKG K260s. Tom Polk has been collecting old radios and miniature tape recorders for decades. 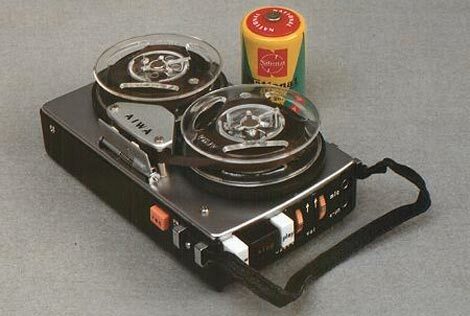 The result is an impressive collection of tube and transistor receivers, along with some amazing miniature tape recorders such as the AIWA shown above with tiny 2.5-inch reels. I'm also partial to the all-metal Monacor executive recorder, which seems to be pushing the limits of reel-to-reel miniaturization. I definitely recommend exploring his radio collection, too - you'll find familiar brands like Sony and Panasonic side-by-side with some unusual sets from the likes of Eico, Bulova (yes, the watch company) and Wilco. It's always a good idea to have a ray gun within reach, because you never know when the alien invasion will come. Muddy Mountain Pottery understands your interplanetary armament needs and offers a series of handmade weapons guaranteed to fibrillate even the angriest Venusian from up to 10 femtoparsecs. The brains behind the operation are West Magoon and Tana Libolt, who live and work in Centennial, Wyoming (population 100) and are busy building a home and studio from used tires. Apparently, marauding aliens dislike the scent of vulcanized rubber almost as much as the typical North American despises Marmite. 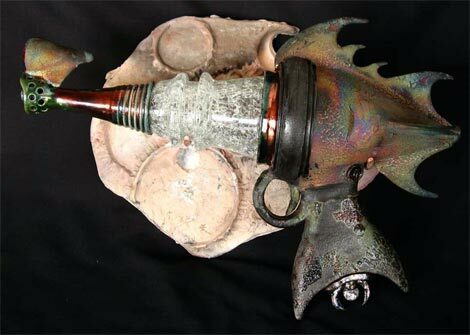 West's latest creations are a trio of ray guns that feature antique glass insulators as part of the gun barrel. Check them out at muddymountainpottery.com. Battery-driven electronic gadgets have taken the fun out of childhood. 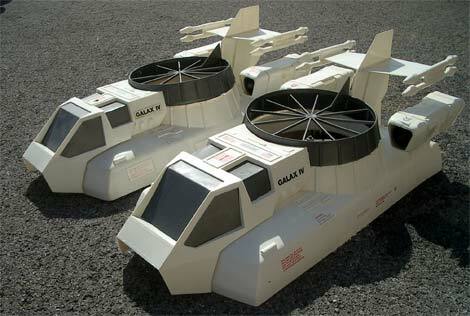 As a case in point, I present Peter Hirschberg's tremendously cool fleet of Testors Galax IV Hovercraft from the late 1970s. These little vehicles don't rely on puny batteries and microchips, opting instead for brilliantly noisy and somewhat scary Cox Surestart .049 engines. They run on "glow fuel" - a planet-choking mixture of 20% castor oil, 25-35% nitromethane and methanol. The Galax IV has no remote control. In fact, it has no controls to speak of at all. You simply start the motor and let it bounce around your patio or yard untethered until it runs out of fuel or dismembers an unlucky passing squirrel (I jest - the prop is fairly well protected). The Galax floats about an inch above the ground, and the instruction guide reveals several excellent ways to destroy your new toy in a hurry: "The Galax will fly best over hard surfaces, such as asphalt and concrete, the cleaner the better. Grass surfaces might work, but you'll have to try each one yourself. Galax will fly over water. However, it does leave an oil slick and it will not float when the engine stops." (In other words, the first thing I'd have done with one of these is scuttle it not-so-accidentally in a swimming pool). Hirschberg's Galax IV tribute page includes more pics, a scan of the instructions and even an mp3 recording of the flexidisc instructional record that came in the box. Oh, Canada. 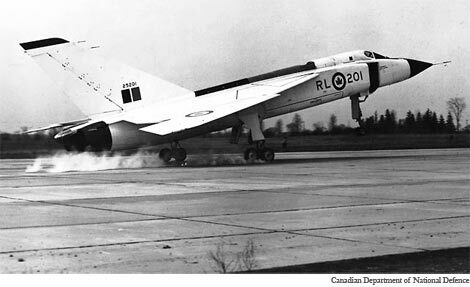 I've been waiting for someone to write a tribute to the Avro Arrow. Alas, the fiftieth anniversary of her first flight came and went earlier this week without so much as a quiet sigh. 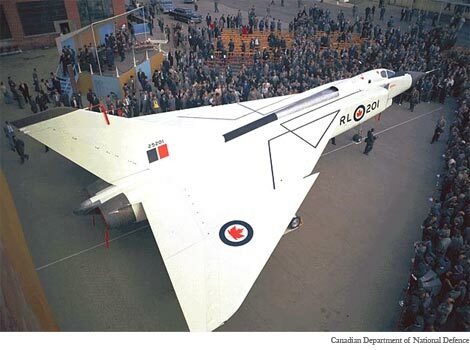 The CF-105 Arrow was Canada's ill-fated foray into the world of advanced jet fighter design. The delta-wing design was considered by many to be decades ahead of its time. The aircraft first flew for just over half an hour on March 25, 1958. By the time the Arrow program was canceled on February 20, 1959, five prototypes had flown a total of 70.5 hours. The design reached Mach 1.96 and 50,000 feet - impressive achievements in that era. Although rapidly escalating development costs and Canada's integration into NORAD played roles in the Canadian government's decision to cancel the program, the launch of Sputnik 1 in October 1957 greatly influenced the political landscape as well. The arrival of the Space Age foreshadowed the development of intercontinental ballistic missiles that were untouchable by even the most advanced supersonic interceptor. The cancellation of the program in early 1959 caught Avro off guard, and the aircraft, engines, tooling and plans were ordered destroyed within weeks to avoid them falling into Soviet hands. All that remains of the $260 million program today is a single nose section and a couple of wing panels. It was an ignominious end for a once-promising aircraft. The history of recorded sound will have to be amended slightly, thanks to the successful playback of an optical Phonautogram dated April 9,1860 - almost eighteen years before Thomas Alva Edison's famed phonograph was awarded a patent on February 19, 1878. The oldest playable recording has long been considered an 1888 excerpt of a Handel Oratorio captured on a a fragile Edison wax cylinder at London's Crystal Palace (Edison's system used wax-coated cylinders, unlike Emile Berliner's competing gramophone with its more familiar 78 RPM discs). The New York Times is reporting that a 10-second snipped of "Au Clair de la Lune" was recently discovered by a team of American audio historians in Paris. The recording was captured with a phonautograph, a machine that captured a visual representation of sound on lamp-blackened paper rolls. It wasn't intended for playback, since no technique for translating squiggles on paper into sound existed at the time. The man behind the system was an almost-forgotten Parisian named Édouard-Léon Scott de Martinville. 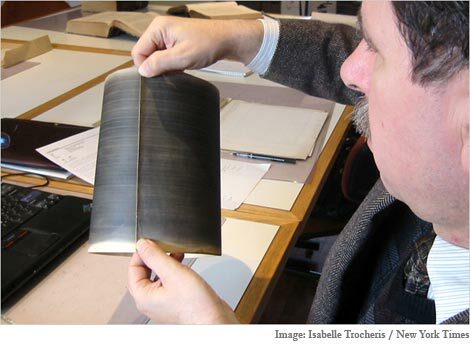 The research team, led by audio historian David Giovannoni, discovered a sheet of rag paper that held remarkably well preserved sound wave tracings. They turned the paper over to scientists at the Lawrence Berkeley lab who retrieved the sound with the help of modified software that was originally intended to play high-resolution maps of grooved records. The result is an eerie fragment of song by an anonymous vocalist: Au Clair de la Lune [mp3]. MAME is an arcade game emulator that is frequently used to build multi-game home arcade cabinets. It simulates popular arcade system harware from the 1980s and 1990s, right down to the graphic display engines and sound systems. Many enthusiasts have built MAME cabinets around old PC motherboards, but here's our guide to building your own Linux or Windows based 'MAME Brain' for less than $150. This tiny system includes an Intel Mini-ITX (6.75" x 6.75") motherboard with built-in processor, a 4 GB solid state drive, and a programmable arcade controller interface that allows you to connect real arcade buttons and joysticks for an authentic gaming experience. I used to fly a lot. My least favorite aircraft was the DeHavilland Dash-8, a noisy twin-engine turboprop commuter plane that has the ability to transform a quick 45 minute jet flight into 90 minutes of stupefying rattle and hum. I reacted to repeated Dash-8 exposure by becoming a huge fan of a regional airline that flew nothing but chunky 737 jets, even on half hour flights. I wasn't alone. By 2000, airlines around the world responded to customer demand by replacing shuddery turboprops with sleek new regional jets from Bombardier and Embraer. It looked like the turboprop era had come to an end. However, the lowly propeller is set to make a comeback. Jet fuel prices have soared as much as 70% over the past 12 months. Suddenly, regional jets don't make economic sense on many short-haul flights. 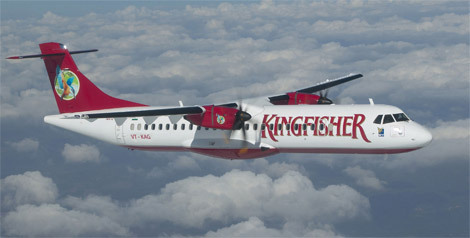 Turboprop aircraft such as Bombardier's 78-seat Q400 now have per-seat costs of around 30% less than comparable jets. That's a lot of money, especially in the perpetually struggling airline industry. The result is renewed airline interest in turboprop designs out of economic necessity - passenger comfort be damned. Canadian manufacturer Bombardier is considering stretching its Q400 design to accommodate 90 seats, and French/Italian manufacturer ATR is looking into a larger design to follow up its successful 74-seat ATR-72-500 model. Steven Ridolfi, President, Bombardier Regional Aircraft, succinctly sums up the turboprop advantage: "At 360 knots, the Q400 airliner combines jet-like speed with among the lowest operating costs of any regional aircraft." It will be interesting to see what the next few years bring. One thing's for sure: Propeller-driven aircraft aren't going to vanish anytime soon. 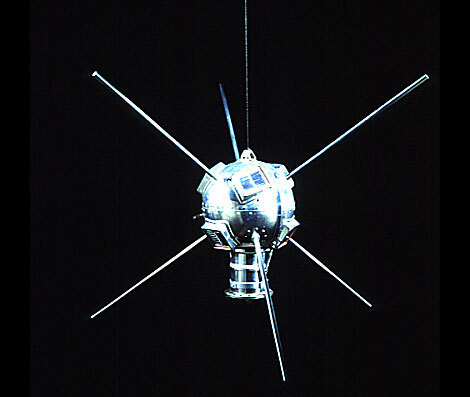 Even though it was the fourth man-made satellite successfully launched into space, Vanguard 1 has earned a special place in history as the oldest spacecraft in orbit. The shiny 1.47kg (3.2lb) spherical spacecraft was launched from Cape Canaveral, Florida on March 17, 1958. Scientists originally believed it would remain in orbit for several thousand years, but solar radiation and atmospheric drag have reduced its off-world vacation to about 240 years. 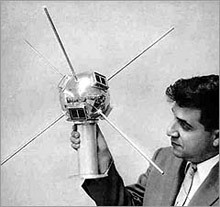 America's second successful satellite (an earlier failed Vanguard Project launch was dubbed 'Flopnik' by thre press) was equipped with two radio transmitters, including the first solar powered transmitter to reach space. The primary battery powered transmitter lasted until the batteries were exhausted in June 1958, while the solar equipped radio remained operational until May 1964. Vanguard now orbits the earth silently once every 132.4 minutes and has traveled a whopping 10 billion kilometers over its lifetime. Vanguard 1's rudimentary transmitters enabled researchers to determine that the earth was slightly pear shaped. It had a diameter of only 16.5 cm (6.44 inches), causing Soviet leader Nikita Khrushchev to dismiss it as "the grapefruit satellite." Still, Vanguard's successful launch into a permanent orbit using a three-stage rocket and its pioneering use of solar technology were indeed vanguards of things to come. Our resident retrofood critic Giles Perkins has revealed a "pre-prototype" of what could turn out to be an amazing Super 8mm video transfer system. Matthew Greene is hard at work pairing the Red One Camera with the surprisingly affordable MovieStuff Video Workprinter. 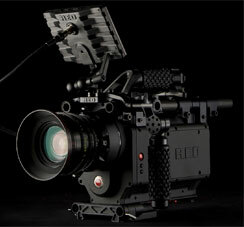 The result should be high-resolution single frame capture at up to 30 frames per second. The Red One supports resolutions up to 4K (4092 horizontal pixels), far outstripping the resolution and bit depth of Blu-ray hi-def video (and 8mm film, for that matter). The MovieStuff Workprinter is a film projector modified to offer frame-by-frame digital capture. 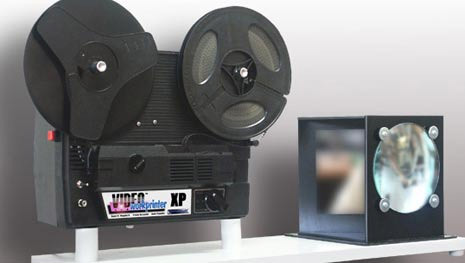 Unlike companies who recommend projecting film on the wall and videotaping the result, Moviestuff's equipment digitizes each movie frame sequentially using a digital camcorder connected to a Windows or Macintosh computer. Over 1000 units have been shipped, with prices starting at a mere $1395. 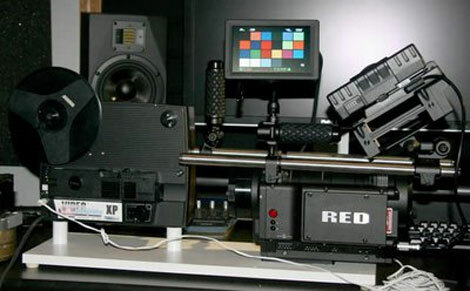 WorkPrinter owners usually mate their equipment with a decent standard definition prosumer camcorder, but Matthew Greene has chosen to integrate the Red One HD camera, which offers cinematic quality at a starting price of under $20,000 - a mere fraction of the price of comparable high-end digital cinema cameras. The Red One is capable of significantly outstripping the resolving power of Super 8 film, enabling HD transfer that captures the magical look and grain of Super 8. I can't wait to see footage captured with this setup, which brilliantly combines technologies developed four decades apart. Everything comes at a cost. The flood of increasingly clever and inexpensive electronic gadgets from East Asia over the past decade has created a new breed of young technology addicts who thrive on the release of each revolutionary new gizmo. There's no doubt that technology can be exciting and empowering. Unfortunately, it turns out that we've been receiving far more than just shiny iPods and game consoles in return for our hard-earned dollars/pounds/euros. 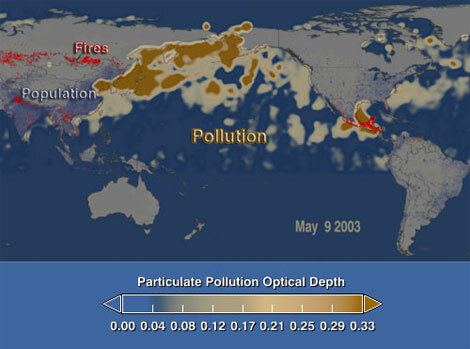 A new NASA study pegged the trans-Pacific flow of pollution aerosol at almost 40 billion pounds between 2002 and 2005, with 10 billion pounds of airborne pollution making its way from East Asia to North America each year. That's about the same as 15% of the total emissions originating locally in the USA and Canada. In other words, our shiny new toys are quite literally fouling the air we breathe. The big picture is actually worse than the study suggests, because their data excludes the damage inflicted upon our inland waterways and oceans, nor does it measure the local impact of thousands of factories in the far east. Paradoxically, the simplest solution is also the hardest. Oh, the Mini. Released in 1959 as Britain's answer to the ubiquitous VW Beetle, it was a capable and affordable everyday runabout that could even be turned into a respectable rally car. 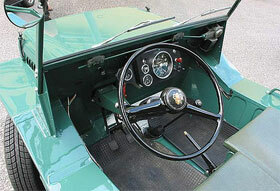 It remained in production for four decades, becoming the most popular British car in history. In the early 1960s, Sir Alec Issigonis took the basic design of the Mini and attempted to militarize it. The result was the Mini Moke - a lightweight miniature utility vehicle intended for parachute drops. Unfortunately, its diminutive size and 848 cc straight-4 engine proved less than ideal in the field, where its poor ground clearance, 10 inch wheels and pokey performance didn't fare well. I suspect the Army was none too happy about driving around in vehicles that looked like khaki green clown cars, either. 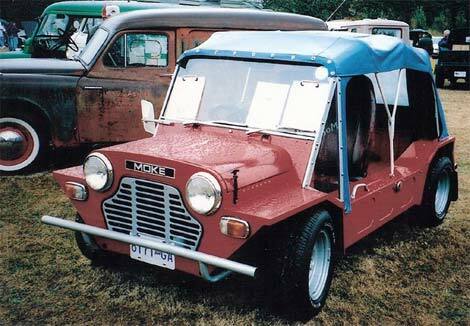 In the end, the British Motor Corporation decided to release the Mini Moke as a civilian vehicle. It debuted in 1964 and quickly became a cult hit. The Moke took a leisurely 22 seconds to reach 60 mph and had a top speed of 65 mph, hardly qualifying it as the idea vehicle for the Autobahn. It was too quirky to see widespread adoption, as urban commuters and young families opted for more practical Mini Saloon and Estate cars instead. Less than 15,000 were built before UK production ceased in 1968, although tens of thousands more were manufactured in Australia until 1981 and in Portugal through the early 1990s. These days you're most likely to see a classic Moke bombing around a resort area or driving its last few miles as a quirky student car. They're definitely worth taking for a quick spin, if only as a reminder of how far the automotive industry has progressed in a few short decades. It's Easter Sunday, and here in Chicago we have snow on the ground. So I'm trying very hard to think warm thoughts about Easter traditions. There weren't too many Easter themed TV specials that I can remember besides the Charlie Brown one, and Rankin Bass' "Here Comes Peter Cottontail" (which hasn't fared the years all that well, I'm disappointed to say). One unexpected Easter TV tradition is this classic commercial for M&M's candies. I don't know when the ad started running - the scuttlebutt says 1982, but I think that it may be earlier. It played for years after. I think that I saw a version of it just a few years ago, which I thought was just great. One could nitpick that the fashions are out of date, but who cares? It might seem weird to be nostalgic over a TV commercial, but then again Christmas just isn't Christmas until you see Santa sledding around in the head of a giant electric shaver, right? Happy Easter everybody! Bawk! Bawk! The Tape Project was founded to bring "master tape sound" into the living room. 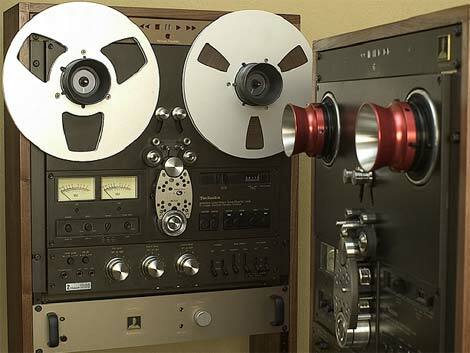 Each release is recorded onto 1/4" half track analog reel-to-reel tape at 15 inches per second. They claim, "You just aren't going to get any closer to the original master, short of buying a record label or two." The current catalog consists of 10 hand-picked albums, including Sonny Rollins' seminal Saxophone Colossus (1956), Bill Evans' Waltz for Debby (1961), along The Robert Cray Band and Malcolm Arnold conducting the London Philharmonic Orchestra. 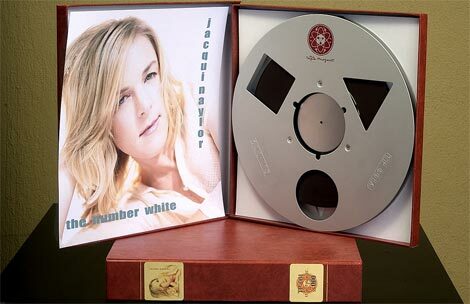 There's even a brand new album by Jacqui Naylor that was mastered exclusively for The Tape Project. The process starts by creating a 1" duplication master from the original analog master tape, which is then dubbed to a bank of finely tweaked Ampex ATR-100 decks. The result is the highest-quality "home format" analog copy possible. The Tape Project is the brainchild of Dan Schmalle, who is also the driving force behind Bottlehead Corp, who manufacture a range of well respected tube amplifiers and modifies tape decks with the CCIR/IEC1 playback equalization required to play these tapes. 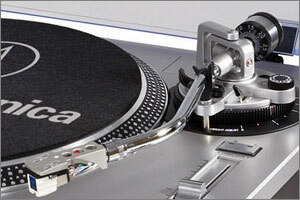 I'll let them explain: "We ended up choosing the Technics RS-1500 as our starting point. They are attractive looking machines, they offer the versatility of both 1/4 track and 1/2 track playback heads and three tape speeds, and most importantly they have what we feel is a superior tape transport path, the isolated loop. The RS1500 uses a servo reel control system combined with dual pinch rollers on a single capstan to maintain constant tension on the tape. This results in very stable, low flutter playback. The one possible shortcoming of the RS 1500 is its lack of IEC playback equalization. In actual practice this is not such a big issue, because the quality of the playback electronics in all of these late 20th century prosumer grade machines is dismal. The only way to get the full benefit of the sonic quality of Tape Project Tapes is to use better outboard playback (repro) electronics anyway." The project gurus suggest twinning your modified RS-1500 tape deck with the $4000 Bottlehead Repro tape preamplifier, along with whatever high-end audiophile amplifier and speakers you have lurking in your mansion's listening room. A charter subscription includes all 10 albums from the 2007 catalog and retails for $2000, including shipping within the USA and Canada. They also offer a Selective Subscription that allows you to choose any six of the ten titles for $1200. There's no word on the titles lined up for the 2008 catalog, since the team is still working hard to fulfill their current order backlog.